Creative Magnetic Artists was established in 2010. It started as a small in-house project in a day program facility called OPTIONS but expanded quickly; projected sales were met and exceeded. Creative Magnetic Artists began selling their designer jewelry at shows around the Billings area and from the back office of the space of OPTIONS. Creative Magnetic Artists stems from a company called Residential Support Services. RSS was started in 1974 with two group homes supporting adults with developmental disabilities. Today RSS serves over 85 individuals in over 14 group homes and one day program called OPTIONS. OPTIONS was added to RSS January 2008. It was designed to give individuals an opportunity to design their day around things they like to do, taking them out of the existing day programs they were use to. After putting their heads together, the Executive Director of RSS and the OPTIONS Program Manager came up with the idea to design magnetic jewelry. The idea was presented to the individuals that attend OPTIONS, and was met with enough enthusiasm, that it was given a try. The first few prototype bracelets were a great success, they sold very quickly. At first business was directed more to the individuals and staff at RSS (they were an excellent Christmas present) but people from outside the corporation heard of them and began requesting them. Soon there was a backlog for bracelet orders, so OPTIONS increased their productivity; necklaces and anklets joined their inventory. Due to the popularity of the jewelry, OPTIONS began to take their wares to the home and holiday shows around the Billings area. In light of their new found success, OPTIONS realized their jewelry needed a trademark business name. After mulling over several choices, the OPTIONS Program Manager came up with the idea, “Creative Magnetic Artists.” The name was accepted and logos were designed. In the spring of 2012, Creative Magnetic Artists had their first advertisement published in the Apostrophe’ magazine. 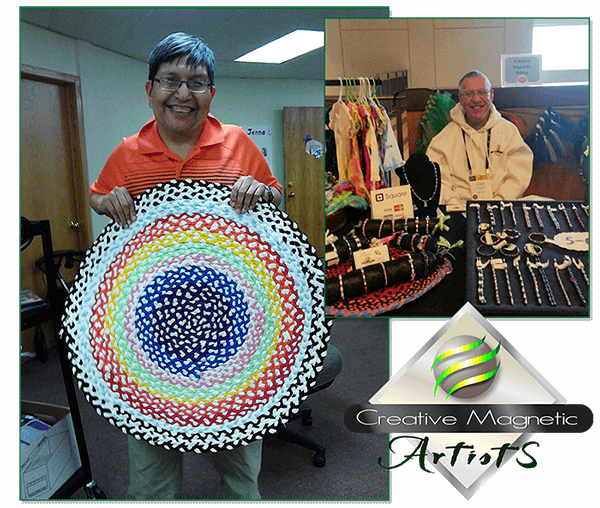 Creative Magnetic Artists employs some of the most talented individuals in the corporation and in the Billings area. They create and design their own jewelry. Every artist employed has an eye for what looks good. All jewelry is made of the finest products and is designed to last. Fortunately for all of us Creative Magnetic Artists didn’t choose to stop at jewelry. Recently a new artist has joined the team, providing us with beautiful handmade rugs made from recycled clothing. They are very unique rugs made by hand with great skill and devotion. All artists that create products for Creative Magnetic Artists are developmentally disabled. Every day they teach us about style and class with their handmade creations.